City Barge has a share in the use of Hertford College’s boathouse on the River Thames in Oxford. It is at Longbridges, on the towpath, half way between Donnington Bridge and Folly Bridge. This is the centre of our weekly activities and where we keep up to six boats. There is a pontoon where we can give tuition in Venetian rowing standing safely. The Thames at Oxford has a stretch of two and a half miles between Iffley Lock and Osney Lock. We often venture through Osney Lock to go upstream to Port Meadow, or downstream through Iffley lock to Sandford. There are five riverside pubs and a brasserie on these stretches of the Thames. There is a public slipway for boat launching at Donnington. The shallop can be launched here for training days. The very pretty River Cherwell joins the Thames on this stretch and is navigable to us for a mile upstream. This a winding tributary with overhanging willows and horse chestnuts. As one rows upstream one sees Oxford colleges, and half way along we get a glimpse of the new Centre for Islamic Studies, and pass an old mill. The Cherwell passes the end of Oxford High Street as it goes under Magdalen Bridge, but it feels as though you are in the countryside. We have close connections with Venice. Our most popular trip of the year is to the Vogalonga, a 32 kilometer rally around the Venetian lagoon and through Venice. 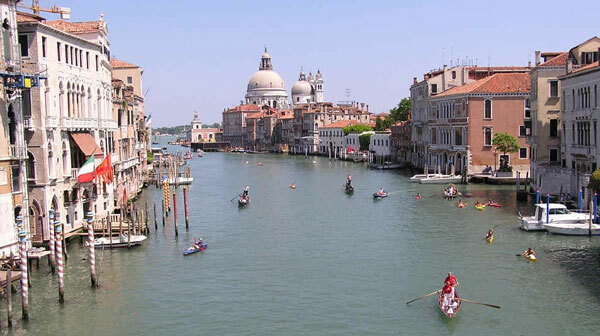 To do this we arrange to row the boats of our associates in Venice. There are three Venetian rowing clubs with whom we exchange visits. They are Querini, Settemari and Giudecca. Querini came to row down the Henley Royal Regatta course in 2004 with their 18 oar “Disdotona”. They give rowing tuition in Venice and gave us our first Venetian club boat, the “Ashley Clarke”, in 1994. 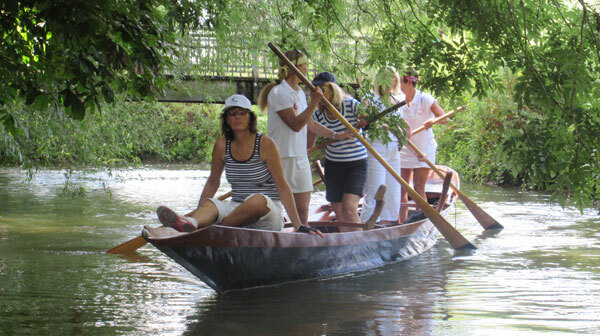 There is a group of enthusiastic rowing tutors called Row Venice, who are great instructors of Venetian rowing. 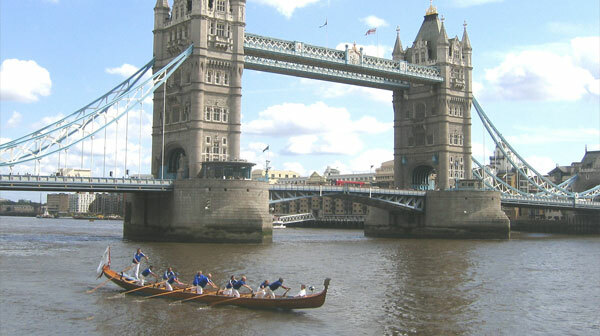 The shallop goes to events in London each year such as the Tudor pull on the tidal Thames, Countryside Live on the River Lee, and the Lord Mayors Flotilla on the tidal Thames. Sometimes we enter the Great River Race which runs from Millwall, on the Isle of Dogs, to Ham near Richmond. The tidal Thames can be rough and the shallop, “Royal Thamesis”, is well suited to this environment. Major events like the Queen’s Diamond Jubilee Thames Pageant are held in London. For this pageant, in 2012, we sent the shallop, and five Venetian boats. In 2007 City Barge organised a major voyage including thirty members from the Settemari Club from Venice. The trip started at Lechlade on the Upper Thames, and finished in London. Members of the Settemari club were very proud when they reached Tower Bridge and then, at the end of the two week trip, finished opposite the Millenium Dome. Henley is the geographical centre of our member’s home locations. It is also a central focus of rowing in the UK. Several of our members are members of Leander Club in Henley, and this is where our committee meets to discuss the organisation of our club and the programme of events in hand. 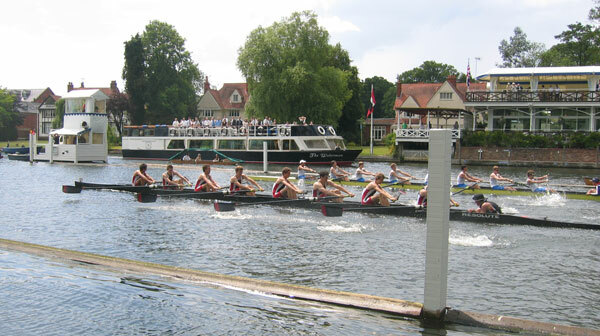 The annual Henley Royal Regatta is a big draw for international rowers and a major social occasion. Several groups, and individual members, visit the regatta over the five day programme. Three members have boats based in Henley. Club rowing outings in the past have included: the river Seine in Paris, the River Duoro in Portugal, The River Lot in southern France, the river Charente in southern France, the river Meuse in northern France, the River Erdre in western France, Lake Windermere in the Lake District, the Kennet and Avon Canal, the Rivers Avon and Severn in central England, The River Nene in Northamptonshire, the Grand Union Canal and Little Venice, the River Cam in Cambridge, and the Norfolk Broads.